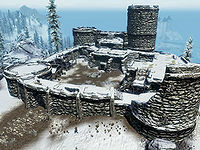 Fort Hraggstad is a bandit-controlled fort located north of Dragon Bridge. It has a courtyard and two interior zones: Fort Hraggstad Prison and Fort Hraggstad. The sizable courtyard and walls are patrolled by up to seven bandits. A forge is situated along the southwestern wall, with an unlocked chest to the left of it. On your right as you pass under the arch into the courtyard is an empty stables, with several barrels of foodstuffs found around courtyard. On top of the two intact towers are random, possibly enchanted bows and quivers of arrows on tables, with the tallest tower also having a long bow as well. Upon entering you are in a room with a bandit roaming and a second bandit sitting at a table to the left. On the table is a small coin purse. There are a couple of wooden benches and a set of shelves holding only clutter behind it, with a knapsack on top. Against the east wall, almost opposite the door, is a second set of shelves holding a woodcutter's axe, iron or banded iron armor, iron gauntlets and helmet. There is a door leading downstairs in the southeast corner. At the bottom of the stairs is a room containing a set of shelves full of more clutter against the east wall and a small wooden table in the southeast corner with a rock warbler egg on top. To the west are stairs down to the cells, which are guarded by another bandit. There are a total of seven cells, four against the west wall and three against the east wall. All of them are empty and unlocked. On your left is a table holding an iron battleaxe and common book. Behind the table is a chair and against the south wall an unlocked chest to the right of two sets of shelves holding several pieces of bread and cheese as well as clutter. As soon as you enter, unless your sneak is very high, you are likely to be confronted by a lone bandit in the first room, who is standing in front of the fireplace directly opposite the entrance. Even the sounds from a loud battle with him are unlikely to reach the ears of the next bandit upstairs, so you can generally deal with them one at a time. To the left of the fireplace is a cupboard holding clutter, a garlic bulb hidden in a wooden bowl and three common books, while leaning against the fireplace is a woodcutter's axe. To the right of the fireplace is a doorway leading further into the fort and in the northeast corner is a wooden table with iron armor, helmet, sword and battleaxe all on top. Through the doorway is a cart at the bottom of a flight of stairs, containing an iron shield, a long bow, iron gauntlets and a potion of minor healing. Climbing the stairs leads to a large room, with a bandit leaning against the wall and the bandit chief at the back of the room in an area being used as sleeping quarters. The front half of the room is being used for storage with several barrels of food under a wooden structure in the northeastern corner. On this is an adept-locked chest and a small wooden table holding three potions of minor healing and some foodstuffs. Against the north wall are two sets of shelves containing three bottles of alto wine, a bottle of wine, some food, a gourd, an iron sword and eight common books. Opposite these is another wooden structure with a barrel containing foodstuffs and a table with a small mead barrel and three potatoes on top. There is a raised section in the middle of the room with a small wooden table holding two bottles of wine. Against the south wall is a single bed and dresser. On the dresser are three loose septims, a bulb of garlic and some bread and cheese. In front of this is an end table with a gourd on top and against the north wall another single bed and another table with a leg of goat roast and a loaf of bread on top. The western end of the room contains four more single beds, an unlocked chest, a table with a tactical map of Skyrim on it that the bandit chief was studying as well as a baked potato, a garlic bulb, a gourd, an iron helmet and a copy of the Archery skill book The Gold Ribbon of Merit. Against the north wall, between two beds, is a cupboard holding an iron helmet. Between two beds against the southern wall are an end table and table with a set of iron armor, iron gauntlets, and an iron mace on top, while leaning against the end table is an iron greatsword, with a pair of iron boots next to the nearest bed. None of the beds in the fort are owned. Sometimes after completing the Imperial quest and being told a garrison of troops will be securing it, the next time you arrive it will be repopulated by bandits.